Happy October #Oatober!!! 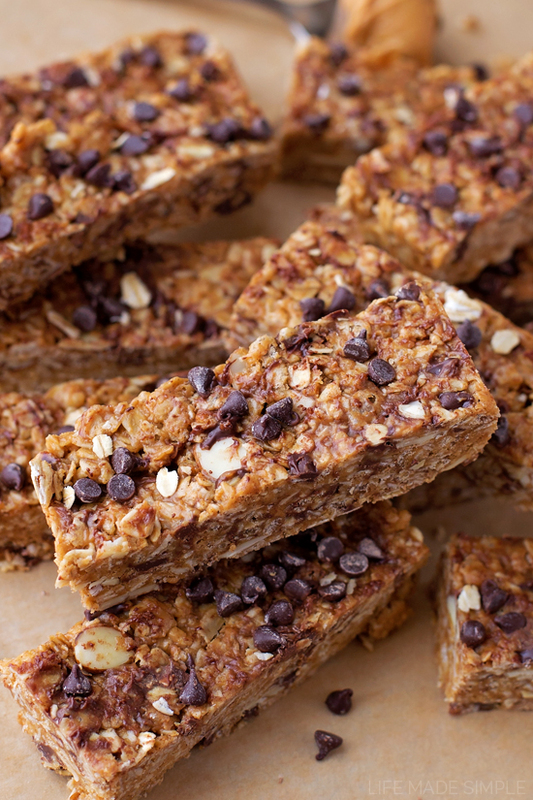 Today I’m teaming up with the lovely folks at Peanut Butter & Co. and Bob’s Red Mill to bring you my latest obsession… these crazy delicious healthy no-bake peanut butter chocolate chip granola bars! Whew, that was a mouthful, pun intended. ???? They’re packed full of wholesome ingredients and only take 10 minutes to make. Sounds too good to be true, right? Think again! 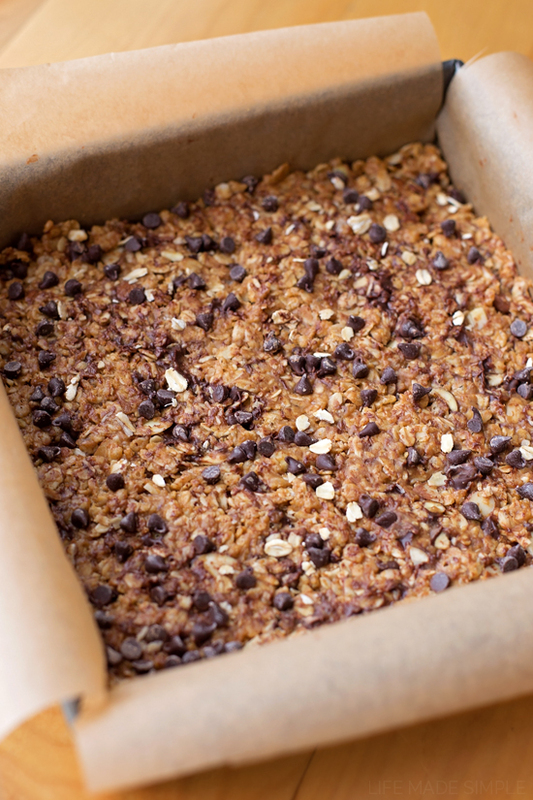 I have to admit, I’ve never really had success with homemade granola bars, until now. They’ve always been too crumbly, too bland or just a pain to make. 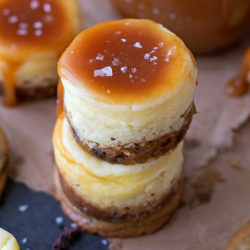 But these, they’re amazing- I’ve made them 3 times already! The best thing about these bars? They don’t require baking, they don’t fall apart, they have no refined sugar, they have no oil/butter, they can be dairy-free (with mini dairy-free chocolate chips), they are gluten-free and only take a few minutes to make. Oh yeah, they actually taste good. That’s kind of a big deal. Did I mention that you can customize the heck out of them too?! The base is a combination of pantry staples, perhaps with the exception of the flaxseed meal (which may be for some, but not others). We’ve got a generous amount of old-fashioned rolled oats, crispy cereal (you can use white or brown rice cereal), sliced almonds and golden flaxseed meal. For flavor and sweetness I used a mix of ground cinnamon, salt, vanilla extract, honey, and of course, peanut butter. These are the ingredients you’ll need. I also tossed in a generous amount of mini semi-sweet chocolate chips too. I’d highly recommend them, but feel free to swap them out for chopped nuts, dried fruit, mini M&M’s, coconut or seeds. To start, you’ll want to grab a medium size microwave-safe mixing bowl and combine the peanut butter and honey. 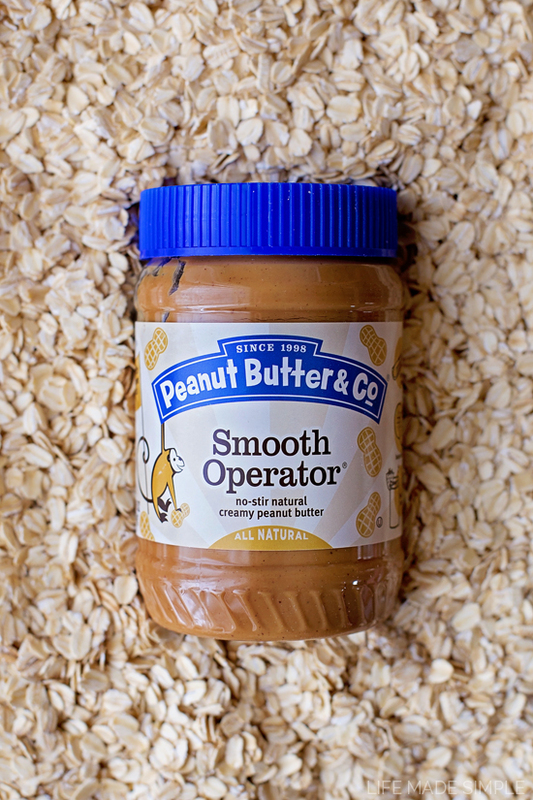 I used Peanut Butter & Co.’s Smooth Operator, but any of their flavors would be amazing!! Heat it on half power for 1 minute, stir and repeat. Add the vanilla extract and whisk until smooth. Let it cool while you prepare the remaining ingredients that way it doesn’t completely melt all of those little chocolate chips that get mixed in. Meanwhile, pulse your oats in a food processor for a few seconds to break them down a bit. It’ll help create a better texture as it absorbs the wet ingredients a bit more. 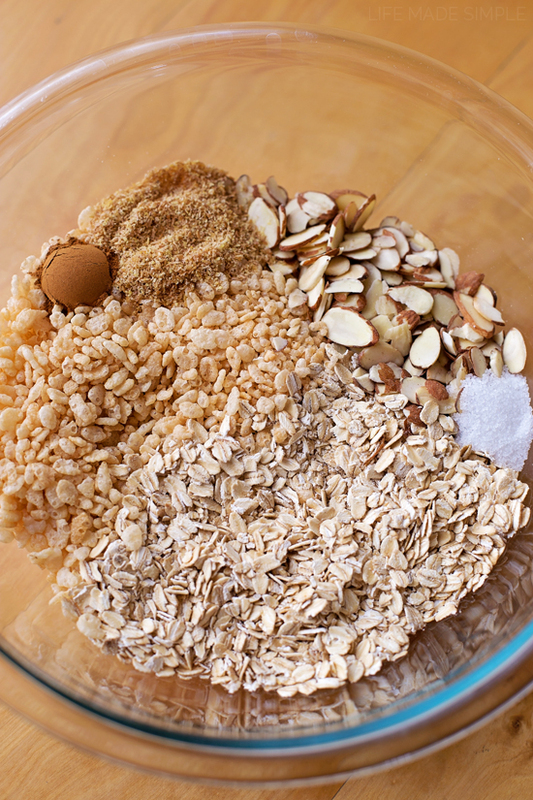 In a large mixing bowl, whisk together the oats, cereal (love the crunch), sliced almonds (also love the texture they add), flaxseed meal (full of nutrients and helps to hold them together), ground cinnamon (very subtle but adds flavor), and salt (always). Everything has a purpose, yet nothing is overwhelming. I love that! Pour the wet ingredients into the dry and mix, mix, mix. Add the chocolate chips and mix some more. Press into a parchment-lined square baking pan and refrigerate for about 2 hours. When they’re solid, remove them from the pan, cut them up and enjoy! I hope you’ll love these as much as we do. They’re great little snacks for both kiddos and adults! Don’t forget to ENTER THE GIVEAWAY for 2 jars of Peanut Butter & Co. peanut butter (of your choice) and a bag of Bob’s Red Mill Organic Old Fashioned Rolled Oats! In a medium size microwave-safe mixing bowl, combine the peanut butter and honey. Microwave on medium power (I did 5) for 1 minute, then stir and repeat. Remove from the microwave, add the vanilla whisk vigorously until smooth. Allow the mixture to rest for about 5 minutes. Meanwhile in a large mixing bowl, combine the oats, rice cereal, almonds, flaxseed meal, cinnamon and salt. Whisk to combine. Pour the cooled peanut butter mixture into the dry ingredients. Using a large spatula, fold the ingredients together until no dry spots remain, then pour in all but 1 tablespoon of the chocolate chips. 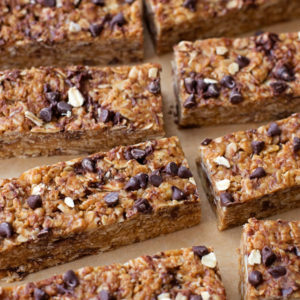 NOTE: it's ok if the chocolate chips melt a little bit, it adds more flavor to the bars! Mix until combined, then pour into the prepared pan. Press firmly to create an even layer. Sprinkle the reserved chocolate chips on top, then cover the pan with plastic wrap and place in the refrigerator to chill for 2 hours. Remove from the pan using the edges of the parchment paper and transfer to a cutting board. Using a sharp knife, cut into 12 rectangular bars or 12 squares. Store in a ziploc bag at room temperature for up to 3 days. -You can easily swap out the chocolate chips for more nuts, dried fruit or seeds. 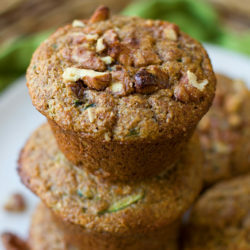 -Almond butter is a great alternative to peanut butter and works really well in this recipe. I want to try pumpkin spice and cinnamon raisin! Yummy ! These look amazing! I would love to try Dark Chocolate Dreams. Thanks for the chance to enter. I would choose the White Chocolate Wonderful and Dark Chocolate Dreams. i would love to try the pumpkin spice and the dark chocolate dreams! I’d love to try Old Fashioned Smooth and White Chocolate Wonderful! 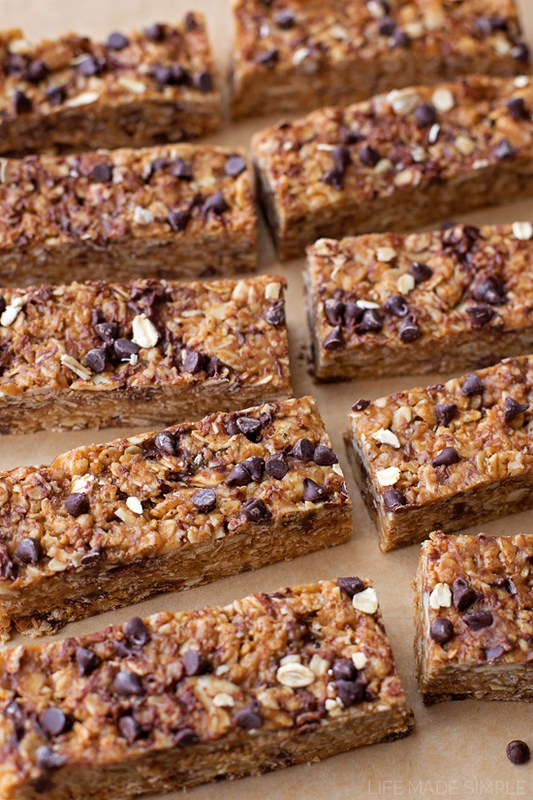 I like making no-bake energy bars – these are ones I’d like to try! I’d like to try the dark chocolate dreams and cinnamon raisin swirl. Pumpkin spice and smooth operator are my choices! I would like to try pumpkin spice and dark chocolate dreams. I love The Bee’s Knees and I would love to try the Crunch Time. I haven’t had crunchy peanut butter in forever! I would love to try the pumpkin spice and the Bees Knees. bee’s knees and smooth operator! I would love to try the Bee’s knees. I would love to try the Crunch Time and Bee’s Knees. I want to try pumpkin spice! I LOVE PUMPKIN! Mighty Maple and Dark Chocolate Dreams. YUMMO! I would love to try the Cinnamon raisin swirl and the Pumpkin spice, they both sound so good. The Dark Chocolate is my favorite, but I’ve never tried the white chocolate or the bee’s knees. The Smooth Operator All Natural is my jam! I’m going to try this recipe the way it is, then change it up with blueberries and dates! An dm second one to try is the cinnamon raisin swirl, because let’s face it, that is every child’s childhood favorite, including mine!! Looking forward to making these bars! I’d like to try Smooth Operator and Crunch Time. I’d love to try Bee’s Knee’s and Dark Chocolate Dream! My favorites are the dark chocolate dreams and of course I was to try the pumpkin spice! Dark Chocolate Dreams sounds good to me, my family might like the maple! I’d love to try bees knees and white chocolate! I’m already in love with the Dark Chocolate Dreams, but I’d love to try the Mighty Maple flavor! I’d like to try Crunch Time & Old Fashioned Crunchy. Nutritional info was not given. I’ve done my best to calculate: per bar – 261 calories, 23 g. carbs, 3.8 g. fiber, 9 g protein, 16 g fat, 12 g sugar. I just made these last night and let them sit in the fridge overnight, but they are still falling apart. What did I do wrong? They taste amazing, by the way! Ugh, I don’t know why so many people are having problems with this recipe, I really apologize! Just made these for my son’s first day of preschool and we love them! Had to make a couple of minor changes but this is an excellent and flexible base recipe that we’ll be using a lot for lunchbox treats. First, we substituted sunflower seed butter for peanut butter so they are nut-free for school (had to skip the almonds, too). Second, we only had 1/4 c of honey left so topped it up with maple syrup. Also, instead of heating the ingredients we just mixed them together (so the chocolate chips wouldn’t melt), first with a spoon then with our hands to combine everything and pack the mixture into the pan. My 3 1/2-year-old loved that part, and it seemed to help keep the bars together. Love these! Can I substitute the honey with something else? Hello! 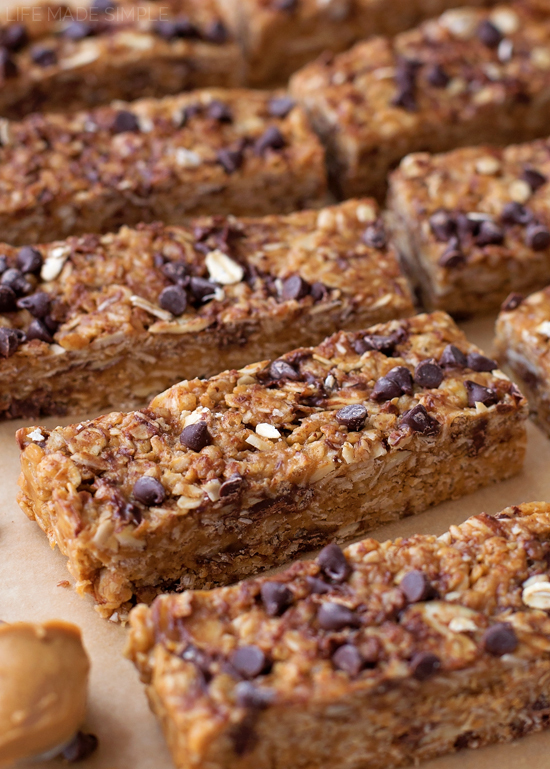 I just tried the no bake peanut butter, chocolate chip granola bars. The taste us AH-mazing!!! But my bars never really solidified and are really flaky. It’s more of a granola at this point. Any suggestions to make it stick together a little better? And maybe I just did something wrong. LOL. Thanks! 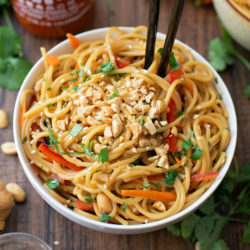 This is awesome recipe !! Tried first time with almond butter and customized quite a bit by adding granola , sesame seeds , grated coconut , raisins . Came out delicious . Thanks for the recipe ! Do you happen to have the nutritional info? I’ve made this recipe heaps of times… Definitely my favourite recipe ever. A couple of tips… Be sure to pack it down hard to get it to stay together and also add a little bit more peanut butter and honey… That helps it stay together. The natural peanut butter I used is pretty thin so I didn’t microwave it and it worked out great! Then I just used my hands to mix everything and press it into the pan. My kids love them! Thank you for recipe! !